The advance of the internet has changed global economy forever, in ways that we never could have predicted. Consumers can shop virtually anywhere in the world without ever changing out of their pajamas or leaving the comfort of their favorite chair. We are all linked in a single marketplace online. But the market is linking outside of cyberspace as well. Just last month DAVIDsTEA, a Canadian retail tea store, expanded into the United States with the opening of its first two US locations, offering a line of 120 delicious teas to thirsty city folk. DAVIDsTEA began in Quebec and has since opened 69 additional locations in Canada. The two New York City locations are the first to break international borders. If you are a nationalist, don’t worry. The gates go both ways. While DAVIDsTEA taps into the American market, Maya Tea is expanding into Canada. For those of you who do not know yet, there now exists Maya Tea Canada, offering our entire line of specialty teas for both wholesale and retail. 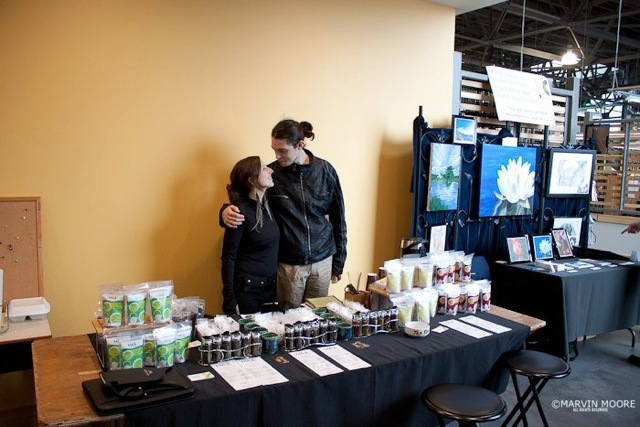 Maya Tea Canada is operated by Dave Moore and Laura Evans out of Halifax, Nova Scotia. Every week the couple prominently displays our line of teas at local farmers’ markets, much like we do here in Tucson, Arizona. And between markets, they are working to bring Maya teas into coffee shops and restaurants across the country, so that everyone can have an opportunity to taste our unique blends. DAVIDsTEA and Maya Tea are similar in many respects, aside from international ambitions. “Throughout his twenties, David wondered why he couldn’t get a decent cup of tea. He thought tea was too serious. He wondered, why can’t tea be more fun?” (davidstea.com)  Manish Shah, owner of Maya Tea, had the same question. He developed Maya Tea as an effort to bring a family chai recipe to the community at large, and his efforts have expanded ever since. He is determined to make loose leaf tea more accessible to the general public, and more fun. After all, we all deserve to enjoy an excellent cup of tea, right? The economy is tough, it’s true. But when the motivations are right, it is possible for companies to share both the marketplace and their mission. DAVIDsTEA and Maya Tea are like that. We don’t infringe on each other’s niche business (ours, wholesale supply and theirs, retail) and each, in a sense, compliments the other. As do the United States and Canada. And so, we welcome DAVIDsTEA to the United States! And for those of you in Canada, we look forward to serving you. And for those of you who are a little further away, don’t worry—there’s always cyberspace, and Maya Tea is proud to offer international shipping on all of our teas. Just visit www.mayatea.ca!